Successfully Added Military Style Helmet Light (White LED, Red LED, Flashing Infrared) to your Shopping Cart. Military Style Helmet Light (White LED, Red LED, Flashing Infrared) – convenient and hands-free light at your side! Great for night navigation, climbing, paintball games, and so much more! 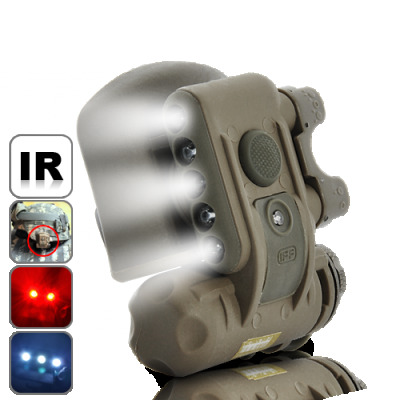 This LED Helmet Light (Military Style) provides low-signature, night-vision friendly illumination for night navigation and close-quarter work like reading maps, loading gear, or repairing equipment in the field. The virtually indestructible LEDs produce white, red, and infrared output at multiple power levels, great for whatever you need it for. Installation is super easy. It attaches via a special mount that clamps semi-permanently to the rim of helmet by means of two socket-head machine screws. Once attached, the light can be easily slid onto the mount, where it locks into place. Depressing a small lever slides the headlamp right off. That’s it! This LED Helmet Light (Military Style) is great for cave exploration, climbing, construction, or search-and-rescue operations - pretty much any activity involving wearing a helmet and requiring low-output, hands-free illumination. Next time you go out for paintball at night? Don’t forget your helmet light! This is the perfect solution if you want a high quality helmet light but do not want to pay the outrageous price tag associated with them. Available in single piece or bulk order, purchase a few today and start showcasing you talents and receive the respect you deserve! Brought to you by your extreme friends here at Chinavasion! This blue LED watch uses 1 pc Sf123A battery.